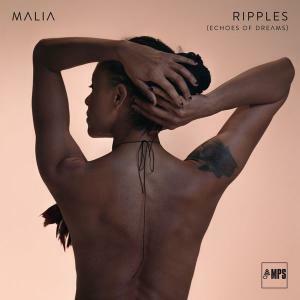 Ripples (Echoes of Dreams)" shows another perspective on Malia's album "Echoes of Dreams" - it's not a remake in the usual sense, but a highly emotional commitment of the British-African musician to her roots, coupled with the experience from the previous albums. Maybe you can't hold on to a dream, but dreams can trigger strong emotional cross-currents. And so it was for singer Malia on her popular, long-lived "Echoes of Dreams". Released in 2004, the songs on that album form the basis for her new recording, "Ripples". It is not a remake in the normal sense; rather, these emotive ebbs and flows are direct links to this British-African artist's highly emotional acknowledgement of her roots. Accompanied by pianist Alexandre Saada's sensitive play and his arrangements for the string trio, Malia has radically stripped down her original work, moving from the playful pop-jazz style of her earlier career towards a raw, blues and soul-drenched sound that, more than ever, relies on the strength and passion of her voice. Malia reflects on the motivations behind once again sounding the echoes of her dreams: "Sometimes life gives you a chance to realign. I feel that I often have a better understanding of my lyrics today than when I wrote them. With the experiences I've lived through, including the hard times, I've had a strong inner desire to re-work the songs." After six stylishly eclectic albums, Malia's re-worked songs on "Ripples" reveal an artist who lays down new challenges for her listeners. At the same time, there's the dividend of the album's poignant authenticity. Whereas the "Echos of Dreams" sessions were distinguished by the desire to experiment with soulful vocal parts, whiffs of jazz, and rock-tinged rhythms, Malia has reversed course on "Ripples". Recording the album in pianist Alexandre Saada's Paris home, Malia emphasizes, "I wanted to tone everything down in order to push the essential core of the pieces into the foreground."